Citation: Enos J, McCarter, Cross R. MRI evaluation of left ventricular volume in children and adults during in-scanner exercise. J Biomed Imag Bioeng. 2018;2(1):72-81. Background: Real-time cardiac MRI (CMR) has been shown to accurately assess cardiac output during exercise when compared with the clinical gold-standard Fick technique; however, most strategies for exercise stress CMR have involved exercise outside of the MRI scanner with rapid transition into the magnet for imaging, which cannot capture active or peak exercise conditions. Novel re-binning reconstruction of real-time imaging data with robust automated motion correction and improved temporal resolution may be well-suited for CMR during in-scanner exercise. Methods: Real-time acquisitions with conventional and re-binning reconstructions were collected in healthy volunteers at rest and at two exercise workloads during in-scanner exercise using an MRIcompatible cycle ergometer. Bland-Altman analyses and intraclass correlation coefficients compared left ventricular volumes measured by each real-time technique during exercise. Results: Twenty-five volunteers were enrolled - demographics [mean ± SD (range)]: age 23.1 ± 11.2 years (10–59); weight, 65.9 ± 18.9 kg (27.1–109); 72% female. Bland-Altman analyses demonstrated no differences in left ventricular volumes obtained via each technique at rest or during exercise with a maximum mean difference of <6 ml (p ≥ 0.05) during exercise. Intraclass correlation coefficients (ICCs) indicated strong agreement between measurement techniques (all ICCs ≥ 0.85). Conclusions: Assessing left ventricular volumes during exercise using the re-binning technique is feasible and yields similar results in adults and children compared to conventional real-time imaging, which has been shown to correlate with measurement of cardiac output via the gold-standard Fick technique. Important advantages of the re-binning technique include improved temporal resolution and signal-to-noise compared to conventional real-time approaches. The re-binning technique also has the added benefit of presenting reconstructed images as a single cardiac cycle for more efficient cardiac functional assessments using standard clinical post-processing tools. Cardiac stress testing is fundamental to the practice of clinical cardiology. Standardized protocols for electrocardiographic and echocardiographic stress testing incorporating both physiologic and pharmacologic stress are commonplace in clinical practice. These protocols provide valuable diagnostic and prognostic data and are used to guide treatment strategies for patients with a variety of cardiovascular disease . Cardiac magnetic resonance (CMR) is the current gold standard for non-invasive evaluation of ventricular volumes and function at rest [2,3]. Advantages of CMR include the ability to assess global and regional ventricular contractile function and accurately quantify ventricular volumes without the weaknesses of geometric assumptions or poor imaging windows. These capabilities have led to a number of meaningful applications for CMR stress testing in adults. For example, several studies have demonstrated the ability of CMR to detect left ventricular wall motion abnormalities induced by pharmacologic stress in adult patients with fixed coronary obstruction or ischemic cardiomyopathy, and have documented the prognostic utility of these findings [4-9]. Similarly, studies have addressed the utility of pharmacologic stress CMR in pediatric patients with acquired or congenital coronary artery disease ; however, as children are generally free from atherosclerotic coronary artery disease, these techniques have not been largely adapted to routine clinical practice. Instead, exercise CMR may have more utility in younger patients with native or palliated congenital heart disease to demonstrate functional abnormalities with exercise. Despite this potential, there are several barriers to CMR during active exercise. These barriers include - but are not limited to - increased patient motion within the scanner bore, increased respiratory motion, rapid heart rates, interference with ECG gating, and the necessity for MRI-compatible exercise equipment. In addition, the current gold-standard for CMR at rest typically involves breath-held steady-state free precession (SSFP) cine acquisitions with retrospective ECG gating [11-13]. This technique is suboptimal in patients who cannot hold their breath, including some pediatric patients and patients undergoing exercise. As a result, development of standardized clinical protocols for exercise stress CMR has been limited, particularly within the pediatric age group. Although exercise stress in able patients can be preferred to pharmacologic stress in certain situations , the logistical difficulty of exercise within the magnet bore has limited the advancement of CMR during active exercise. Despite these technical limitations, continued efforts towards achieving CMR imaging during active exercise are warranted for several reasons. For example, exercise replicates physiologic stress conditions and avoids the expense, logistical difficulty, and potential side-effects of pharmacologic stress. This has led to development of an alternative protocol involving exercise outside of the MRI suite with rapid transition into the magnet bore for image acquisition. These strategies have demonstrated the potential of CMR to supplement standard treadmill exercise testing in predicting meaningful clinical endpoints in adult patients with coronary arteriosclerosis . However, there are inherent limitations to this approach as the physiologic effects of exercise dissipate during the transition from exercise to image acquisition. As a result, the acquired imaging data cannot reflect active or peak exercise conditions. To address this limitation, MRIcompatible exercise equipment has been developed in an effort to achieve image acquisition during exercise within the magnet bore. Novel uses of such exercise equipment have been described in adult and pediatric patients. For example, one study examined the modulatory effect of respiration on the cavopulmonary anastomosis in single ventricle patients palliated by the Fontan procedure  both at rest and immediately after exercise. To accomplish this, an MRI-compatible cycle ergometer was mounted on the end of the MRI scanner bed. Following rest imaging, patients were slid out of the magnet bore to perform cycle exercise with rapid transition back to isocenter for image acquisition. Using this approach, image acquisition was achieved within seconds of exercise cessation, though not during active exercise. Despite these advances in technical equipment, the current gold-standard to assess cardiac performance by CMR typically involves cine acquisitions acquired over sequential breathholds, which is not possible during exercise. Real-time imaging employing various strategies for cardiac and respiratory motion correction have been used to circumvent some of these issues  including the use of rapid real-time cine imaging that does not require breath-holds or ECG triggering (i.e., ungated real-time cine imaging) . Importantly, at least one study conducted by La Gerche et al has validated the ability of real-time imaging to accurately measure cardiac output during free-breathing exercise by direct comparison to invasive measurement of cardiac output using the gold-standard Fick method . This was accomplished by simultaneously measuring cardiac output by real-time CMR and by the Fick technique during exercise in the scanner via placement of pulmonary and radial arterial catheters. Furthermore, this study demonstrated the reproducibility of these findings by repeating the same measurements in each subject after a rest period. Initially, these strategies required manual retrospective respiratory gating using a plethysmograph to detect variations in thoracic volume during free breathing CMR image acquisition. This allows the timing of image acquisition to be correlated with the phase of the respiratory cycle (during inspiration or expiration). Images are then manually selected from a specific phase of the respiratory cycle to minimize the effect of respiratory motion artifact on ventricular volume measurements. This is a labor intensive process, which potentially precludes the use of this technique in standard clinical practice. Techniques for automated reconstruction of real-time data collected over multiple cardiac cycles with respiratory and cardiac motion correction have been described  and further refined using a k-space re-binning scheme . This type of real-time data reconstruction offers automated respiratory and cardiac motion correction with improved reconstructed temporal resolution and signal-to-noise levels when compared to conventional single-shot real-time imaging in patients at rest [21,22]. An important added benefit of the re-binning technique that supports improved clinical efficiency is reconstructed images are presented as a single cardiac cycle rather than a series of heart beats. This makes post-processing for cardiac assessments easier and more efficient with readily available clinical CMR tools. These features offer potential benefits for application during in-scanner exercise. The current study adds to the growing experience using real-time imaging to assess ventricular volumes during in-scanner exercise by comparing left ventricular volume assessments from real-time acquisitions employing re-binning (RB) reconstruction to those obtained from conventional real-time imaging (RT) similar to that validated against the Fick method. Additionally, this extends the feasibility of these techniques to pediatric subjects completing the in-scanner exercise protocols. Healthy volunteers were enrolled to complete the study protocol. The standard real-time acquisition (RT), and the re-binning acquisition (RB), were collected at rest and at two exercise workloads in order to test each technique over a range of heart rates. Imaging at rest also included a standard breath-held SSFP cine acquisition (BH) for comparison to the real-time techniques. Intraclass correlation coefficients (ICCs) and Bland-Altman analyses  were used to compare left ventricular volumes measured by RT and RB at rest with those measured by BH, as well as between the RB and RT acquisitions during exercise. Adult and pediatric volunteers with structurally normal hearts were recruited for the study. The minimum age for enrollment was set at 10 years – a commonly accepted age limit for ability to cooperate with exercise stress testing. As the objective of the study was to determine if RB yielded similar results to RT for left ventricular volume measurements during active exercise, only active cardiovascular disease was considered exclusion criteria. This approach allowed for piloting of the imaging technique during exercise while minimizing risk in this non-clinical study. Other factors potentially impacting ability to perform exercise such as pulmonary disease or smoking status were not considered exclusion criteria for the purposes of this study. The study was approved by the Institutional Review Board at Children’s National Medical Center and all subjects gave written informed consent and assent when appropriate to participate. All images were performed on a single 1.5 T MR scanner (MAGNETOM Aera, Siemens Healthcare, Erlangen, Germany) using a combination of the spine array coil posteriorly and an 18-channel body matrix array coil anteriorly. Two real-time imaging acquisitions were used. The first, RT, was a real-time cine acquisition with a frame duration of 49ms. A total of 5 seconds of real-time data was acquired per slice. Rate 4 parallel imaging was employed with a time interleaved acquisition pattern (TGRAPPA) and a linear reconstruction was used. The field of view was 360 × 270 mm2 and the acquired matrix size was 160 × 80. Twenty k-space lines were acquired per frame with a TR of 2.47 ms and a TE of 1.04 ms.. The second real-time acquisition, RB, acquired 8 seconds of data per slice with rate 4 TGRAPPA. The field of view was 360 × 270 mm2 and the acquired matrix size was 160 × 80. Twenty k-space lines were acquired per real-time frame resulting in a nominal temporal resolution of 24.9 ms per frame. The real-time data was used in a motion corrected re-binning reconstruction  and yielded 30 retrospectively gated cardiac phases per cardiac cycle. The BH technique used an SSFP cine sequence with flip angle 50, FOV 360 × 270 mm2, matrix 256 × 192, slice 8 mm, TR 2.47 ms, TE 1.04 ms, views per segment 11, and a parallel imaging factor of 4. All acquisitions were performed with 9-12 contiguous 8 mm slices in the short axis plane at rest. The number of contiguous slices obtained during rest imaging was increased by two additional slices at the base and apex of the heart during exercise to allow for unplanned adjustment along the long axis of the magnet bore. All image datasets were de-identified on the scanner, and then subsequently post-processed using commercial QMass software (Medis Medical Imaging Systems, Leiden, Netherlands). Left ventricular endocardial borders were traced for measurement of left ventricular end-diastolic volume (LVEDV) and end-systolic volume (LVESV) using the summation of disks technique, with papillary muscles included in the ventricular volume. The MRI compatible ergometer (Lode BV, Groningen, the Netherlands) was mounted onto the MRI scanning table according to manufacturer’s instructions. Each subject was positioned with legs slightly flexed at the knee and feet resting comfortably on the ergometer pedals with a strap fastened over the shoe (Figure 1). Figure 1: Positioning for cycle exercise within the MRI scanner. The chest remains within the magnet bore for image acquisition while the feet are secured to the pedals of the MRI-compatible cycle ergometer. Subjects were then prepared for exercise by reviewing the general progression of the exercise protocol and allowed to practice pedaling the ergometer. Subjects were coached to pedal at 60 rotations per minute (rpm) – a reproducible pace recommended by the manufacturer. This allowed for specific feedback regarding tempo throughout exercise. Consistent efforts to optimize comfort were employed to limit unplanned positional adjustments during exercise and image acquisition. Monitoring of rotational speed and adjustment of resistance level were accomplished via the ergometer software - operated from a laptop computer in the MRI control room connected to the ergometer via fiber optic cables. Initial imaging collected at rest included a BH cine acquisition as well as the free-breathing real-time acquisitions – RB and RT. Following rest imaging, RB and RT were repeated at two exercise workloads. The first workload was a moderate intensity workload generally corresponding to a HR greater than 110 bpm. The second workload was a lower intensity workload generally corresponding to a HR range between 90-110 bpm. The goal of this protocol was to test each image acquisition sequence over a range of heart rates for evaluation of temporal robustness rather than exercising each individual to a strict heart rate cutoff for physiologic assessment purposes. This exercise protocol is similar to prior published protocols using real-time acquisitions to measure cardiac indices  with modifications made to heart rate ranges to accommodate the pediatric age group and volunteers with varying fitness levels. Following rest imaging, volunteers were instructed to begin pedaling and coached to achieve a pace of 60 rpm. Heart rates were displayed on the MRI workstation via standard ECG telemetry monitoring. Heart rate goals were achieved by employing a ramp technique or short-duration step increments to gradually increase resistance (Figure 2). 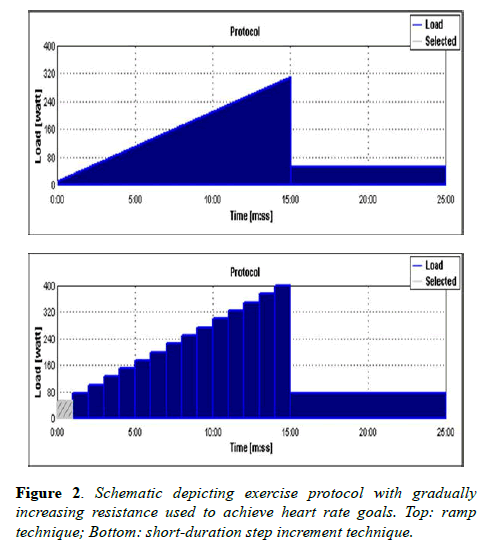 Figure 2: Schematic depicting exercise protocol with gradually increasing resistance used to achieve heart rate goals. Top: ramp technique; Bottom: short-duration step increment technique. Once a desired heart rate was achieved, ergometer resistance was decreased by approximately half of peak in order to optimize comfort but maintain the targeted heart rate during image acquisition. Image acquisition was then initiated. Heart rate was recorded at the start and end of image acquisition to determine variability over the acquisition period. Acquisition times were recorded for each sequence. Image reconstruction times – defined as the time following image acquisition until display of the completely reconstructed image set on the MRI workstation – were also recorded. Following completion of all imaging, subjects were advised to slow their pace and come to a comfortable stop. Average heart rates were calculated for each acquisition at all workloads. The average and standard deviation for heart rate variability over the course of each acquisition was determined. Average acquisition and reconstruction times were determined for each sequence at all workloads. Intraclass correlation coefficients (ICC) were derived to evaluate the strength of association between methods of assessment at rest and during exercise. Bland-Altman analyses were used to evaluate degree of concordance of measurements of left ventricular volumes measured during RT acquisitions to the standard cine acquisitions at rest and extended to measurement of same during exercise. Analyses plotted discrepancies between measurements over the average results space and tested the hypothesis that results using different methodologies did not differ. This was further evaluated by Pitman’s Test which evaluated whether there was evidence that the two methods of measuring volume differed in measurement variability . For hypothesis testing, the 2-tailed type 1 error was set at p=0.05 but borderline differences between p>0.05-p=0.10 were noted as well. A total of 25 volunteers with normal hearts were enrolled. Demographics of the study population were (mean ± SD (range)): age 23.1 ± 11.2 years (10 – 59); weight, 65.9 ± 18.9 kg (27.1–109); body surface area, 1.7 ± 0.28 m2 (1.0 – 2.2); 72% female. A total of 10 pediatric volunteers were enrolled. The youngest participants were three 10-year-old volunteers.The group included 7 girls and 3 boys. Specific ages were 10, 11, 12, 13, 14, and 16 years. One volunteer had previously undergone successful accessory pathway ablation due to a history of Wolff-Parkinson-White syndrome and supraventricular tachycardia. This volunteer had documented normal cardiac function and no recurrence of SVT. Additionally, one volunteer had a history of exercise-induced asthma and self-administered an albuterol inhaler 30 minutes prior to exercise. In total, 17 volunteers completed the full study including all imaging sequences at rest and at two exercise workloads. The remaining 8 volunteers completed all rest imaging and a portion of stress imaging. Two volunteers were unable to complete exercise imaging due to leg discomfort. One pediatric volunteer, 10-years-old, was unable to comply with exercise. Five volunteers had unreliable ECG monitoring due to motion artifact at higher intensity exercise, limiting image acquisition with accurate documentation of heart rate. All five of these instances occurred within the first ten volunteers enrolled as techniques were developed to limit motion artifact from adversely affecting the ECG signal. Initial heart rates ranged from 42 - 115 during rest imaging; 86-121 during the low-intensity workload; and 96 - 140 during the moderate intensity workload; thus achieving the goal of testing each technique across a wide range of heart rates. In general, achieving heart rates above 130 created enough ECG gating interference to preclude accurate heart rate monitoring, particularly in volunteers with a suboptimal baseline ECG signal. The mechanism of this interference included electrical signals created by increased muscle activity during exercise in addition to ECG lead and wire connector movement artifact. The change in heart rate during image acquisition was calculated by determining the absolute value difference between heart rates at the start and end of image acquisition. These values were used to determine the average change in heart rate during image acquisition, which was found to be minimal (Table 1). Table 1: Average heart rates at the start and end of each acquisition during rest and exercise imaging with average change in heart rate during acquisition (± standard deviation). Acquisition and reconstruction times were recorded for each technique. Average acquisition and reconstruction times, respectively, were RT=40, 8 and RB=120, 17 seconds. Both RT and RB techniques had total imaging times within acceptable ranges for clinical utility. All volunteers completed rest imaging including BH, RB, and RT acquisitions. Figure 3 demonstrates typical image examples for each acquisition technique at rest. Figure 3: Example of each imaging technique at rest with left ventricular endomyocardial borders contoured in end-diastole and end-systole. BH=breath-held cine acquisition; RB=real-time imaging with re-binning reconstruction; RT=real-time imaging. Similarly, all volunteers were able to complete imaging at low-intensity exercise except a single RB acquisition that one volunteer did not complete due to leg discomfort. Therefore, there were 24 total RB acquisitions collected at low-intensity exercise. Two RB acquisitions during low-intensity exercise were unable to adequately reconstruct due to motion artifact and ECG gating limitations. A total of six RT acquisitions (3 at low-intensity exercise and 3 at moderate-intensity exercise) were not adequate for analysis due to excessive body motion and unplanned adjustment along the long axis of the magnet bore. Any acquisitions unsuitable for segmentation were excluded from analysis. All acquisitions with proper reconstruction had sufficient image quality for tracing of left ventricular endocardial borders in end-diastole and end-systole (Figure 4). Figure 4: Example of each real-time imaging technique during lowintensity and moderate-intensity exercise. Left ventricular endomyocardial borders are contoured in end-diastole and endsystole. RB=real-time imaging with re-binning reconstruction; RT=real-time imaging. Bland-Altman analyses comparing LVEDV and LVESV for RB and RT to the BH acquisition at rest are shown in Figure 5 and are consistent with the hypothesis of no differences in measurements between techniques. Figure 5: Bland-Altman plots of left ventricular volumes obtained by each real-time technique and the gold-standard acquisition at rest. BH=breath-held cine acquisition; RB=real-time imaging with re-binning reconstruction; RT=real-time imaging; LVEDV=left ventricular enddiastolic volume; LVESV=left ventricular end-systolic volume. 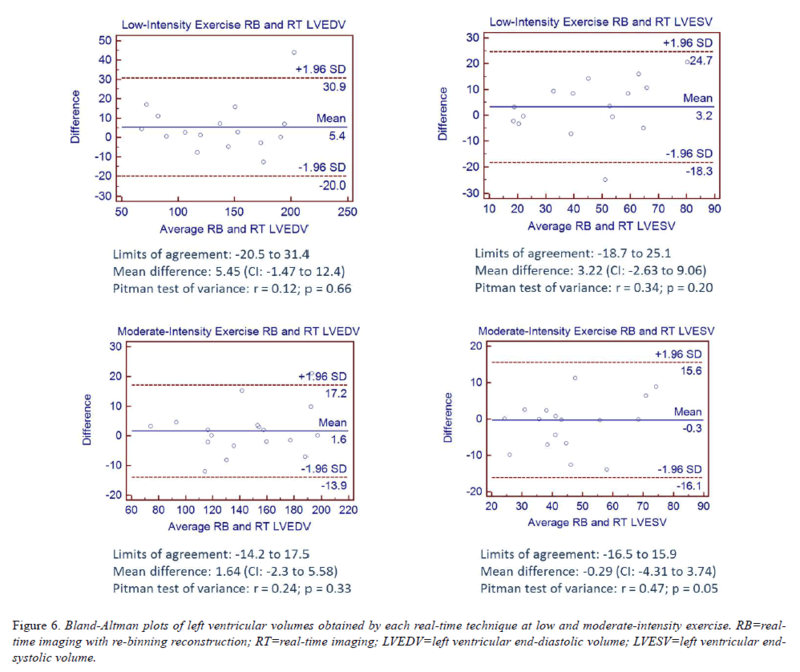 Bland-Altman analyses comparing LVEDV and LVESV measurements obtained by RB and RT during exercise are shown in (Figure 6). All analyses are consistent with the hypothesis that differences in measurements between techniques are due to chance variation with mean bias across all analyses less than 6ml and p ≥ 0.05, noting a marginal p value for LVESV measurements obtained by RB and RT during moderate-intensity exercise. Figure 6: Bland-Altman plots of left ventricular volumes obtained by each real-time technique at low and moderate-intensity exercise. RB=realtime imaging with re-binning reconstruction; RT=real-time imaging; LVEDV=left ventricular end-diastolic volume; LVESV=left ventricular endsystolic volume. ICCs were derived to evaluate the strength of association between methods of assessment at rest and during exercise (Table 2). All ICC values were ≥ 0.85 indicating strong agreement between the two methods. This was further supported by the generally small deviation between paired measurements by the failure of the Pitman test to reject the notion of similar variance between the two assessments. Table 2: Summary of intraclass correlation coefficients for each technique at rest and with exercise. The ability of CMR to accurately assess cardiac function without limitations of geometric assumptions or poor imaging windows has brought major advances to the practice of clinical cardiology for patients with acquired and congenital heart disease. Initially, technical constraints limited the use of CMR to assess cardiac performance during exercise; however, advances in real-time imaging and MRI-compatible exercise equipment are bringing exercise stress CMR closer to realization. La Gerche et al. have validated the ability of realtime imaging, such as the RT acquisition described in this study, to measure cardiac output by comparison to the goldstandard Fick technique . In the current study, analyses comparing left ventricular volume measurements obtained by both RB and RT demonstrate a high degree of agreement at rest and exercise in both adult and pediatric subjects. Although the ability of the RB technique to measure left ventricular volumes has not been compared to a gold-standard in the current study, the results demonstrate that assessment of left ventricular volumes during exercise by RB correlates with assessments made by the more conventional RT approach, which has previously been shown to correlate with Fick determination of cardiac output in prior studies . RB offers the additional benefits of improved temporal resolution and signal-to-noise when compared to conventional RT imaging. 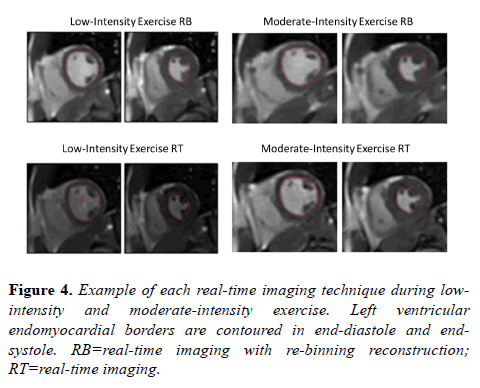 In addition, clinically acceptable imaging times and presentation of the reconstructed images as a single cardiac cycle for easy post-processing using currently available tools add to the robustness of the RB technique for clinical use. Although the RB technique is well suited to accommodate for the increased respiratory motion of exercise, making imaging during in-scanner exercise possible, it is reliant on adequate continuous ECG gating, which can be problematic. Several strategies were developed during this study to mitigate ECG interference to allow for proper reconstruction with LV volume measurements consistent with those obtained by the RT technique. This began with careful positioning of each subject as described in the methods section. MRI-safe padding was positioned to support head and neck comfort throughout the study. Subjects were positioned such that their knees would not hit the upper portion of the MRI scanner during pedaling. Accommodation for subjects with long legs was achieved by having subjects move their torso away from the pedals such that the amount of flexion of the knee was decreased. This was successful in terms of allowing subjects to be imaged at isocenter in most cases - though occasionally at the expense of optimal comfort. In two instances, subjects were imaged slightly off isocenter to facilitate comfort. Although no specific analysis was performed, there was no subjective difference in image quality for these subjects. Volunteers were given ample opportunity to practice pedaling, ask questions regarding the protocol, and receive feedback regarding the goal cycling pace (60rpm). Volunteers were encouraged to cycle their legs intermittently between rest image acquisitions to avoid cramping or positional discomfort. The proportion of volunteers that were able to complete both exercise conditions increased as our team became more facile with the exercise protocol. This is attributed in part to the ability to work through the protocol more quickly before volunteers could tire. The duration of exercise required for this study was relatively long as each volunteer was encouraged to exercise through each real-time acquisition at two exercise workloads. In practical applications, exercise would likely be over a shorter period of time with fewer acquisitions. The five volunteers with unreliable ECG monitoring occurred within the first ten volunteers enrolled – all were adult volunteers. Using simple strategies such as optimizing ECG lead position to achieve maximum QRS signal and positioning the telemetry transmitter at the subject’s side to limit motion with exercise allowed adequate ECG gating and heart rate monitoring in the remaining fifteen volunteers. While no ECG signal filtering or post-processing was employed, these techniques could make imaging using this technique more robust. This study piloted the use of an in-scanner exercise protocol to assess left ventricular function in children – a group with inherent challenges for compliance with exercise. The youngest participants were three ten-year-old children. Two completed the full protocol, but one did not stay motivated beyond short periods of exercise despite attempts to optimize comfort and coaching by experienced pediatric MRI staff. All older children were able to comply with exercise. There was no subjective difference in image quality for pediatric subjects compared with adults. Eventual clinical applications in younger patients with congenital or acquired heart disease may be particularly useful as pharmacologic stress testing is often of limited utility in this group. For example, these techniques could provide a reproducible and non-invasive method for quantifying ventricular function during exercise in patients with anomalous origins of the coronary arteries or coronary abnormalities following Kawasaki disease. This will likely require development of additional motivational strategies not used here such as visual feedback tools. Further studies are needed to determine the feasibility and clinical utility of exercise stress CMR in patient groups. As mentioned, this study did not compare real-time imaging techniques during exercise to a gold standard; however, others have validated similar real-time CMR determinations of cardiac indices during exercise against the gold-standard of the Fick technique . Not all subjects were able to complete the full protocol – reducing the number of datasets available for analysis; however, important information regarding optimization of patient comfort and technical approaches was gleaned by these instances and reported above. Images were only obtained in the short axis plane and not in the horizontal long axis – precluding the ability to reference an alternative plane when contouring the endocardial borders. For clinical application, additional imaging in the horizontal long axis would likely be beneficial. In future studies, repeating the protocol with the same individual would add to the findings by providing an assessment of reproducibility and variation in the measurements technique. While including ten pediatric volunteers allowed experience to be gained with this age group, not all barriers to exercise CMR to assess ventricular function in children were addressed. For example, exercise equipment designed ergonomically for children as well as inclusion of age-appropriate motivational strategies may improve the ability of younger patients to comply with exercise. Normative values for end-diastolic and end-systolic volume changes measured by exercise CMR do not exist. If these techniques progress toward inclusion in clinical practice, normative data will need to be collected to establish meaningful comparisons to normal values for patients with suspected or known cardiovascular disease. 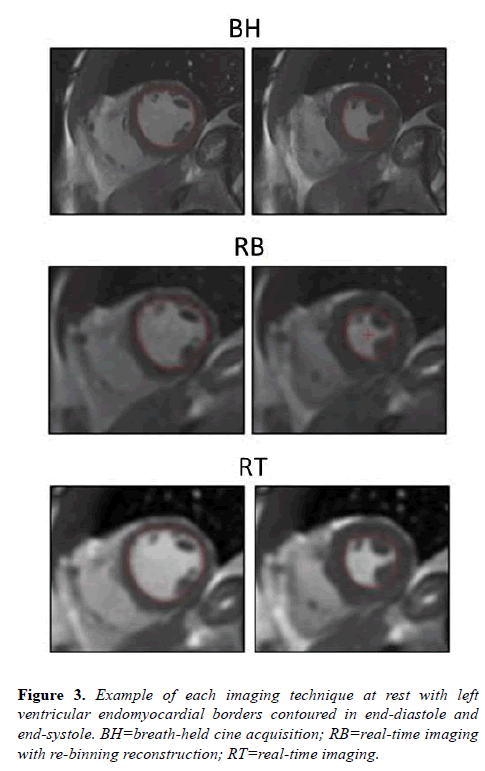 Conventional real-time CMR imaging has been previously shown to compare favorably to the gold standard Fick technique for measurement of cardiac output during in-scanner exercise. Our current analysis demonstrates that the novel re-binning reconstruction method yields similar left ventricular volume measurements compared to conventional real-time cine imaging under exercise conditions. Features of the re-binning method, including automated motion correction, better temporal resolution and improved signal-to-noise, provide advantages beyond those of conventional real-time cine imaging. Additionally, short imaging times, and presentation of the reconstructed images as a single cardiac cycle improve the clinical efficiency of the re-binning approach. These advantages must be weighed against reliance on continuous ECG gating throughout the acquisition, but continued efforts to optimize patient comfort and ECG fidelity while producing reliable image quality will enhance the clinical applicability of the technique for in-scanner exercise of pediatric patients in the future. JE: Conceived the study design, performed imaging, performed endomyocardial tracings, collected data, calculated the statistics, and prepared the manuscript. RM: Calculated the statistics and helped revise the manuscript. RC: Conceived the study design, reviewed endomyocardial tracings, provided critical review, and revised the manuscript. All authors read and approved the final manuscript. This research was supported by the Intramural Research Program of the National Institutes of Health, National Heart, Lung, and Blood Institute (contract number HHSN268201500001C).The authors would like to acknowledge the contributions of Michael Hansen PhD, Peter Kellman PhD, and Hui Xue PhD from the National Heart, Lung, and Blood Institute, National Institutes of Health, Bethesda, MD, USA for developing the imaging algorithms and software programs used in this study and assisting in conceiving the study design. Ashley, Myers, Froelicher. Exercise testing in clinical medicine. Lancet. 2000;356:1592-9. Sakuma H, Fujita N, Foo TK, et al. Evaluation of left ventricular volume and mass with breath-hold hold cine MR imaging. Radiology. 1993;188:377-80. Grothues F, Smith GC, Moon JC, et al. Comparison of interstudy reproducibility of right ventricular volumes, function, and mass with cardiovascular magnetic resonance. Am Hear J. 2004;147:218-23. Hundley WG, Morgan TM, Neagle CM, et al. Magnetic resonance imaging determination of cardiac prognosis. Circulation. 2002;106:2328-33. Jahnke C, Nagel E, Gebker R, et al. Prognostic value of cardiac magnetic resonance stress tests: adenosine stress perfusion and dobuamine stress wall motion imaging. Ciculation. 2007;115:1769-76. Wallace EL, Morgan TM, Walsh TF, et al. Dobutamine cardiac magnetic resonance results predict cardiac prognosis in women with known or suspected ischemic heart disease. JACC Cardiovasc Imaging. 2009;2:299-307. Kelle S, Egnell C, Vierecke J, et al. Prognostic value of negative dobuatimne-stress cardiac magnetic resonance imaging. Med Sci Monit. 2009;15:131-6. Pilz G, Jeske A, Klos M, et al. Prognostic value of normal adenosine-stress cardiac magnetic resonance imaging. Am J Cardiol. 2008;101:1408-12. Ingkanisorn WP, Kwong RY, Bohme NS, et al. Prognosis of negative adenosine stress magnetic resonance in patients presenting to an emergency department with chest pain. J Am Coll Cardiol. 2006;47:1427-32. Ntsinjana HN, Tann O, Hughes M, et al. Utility of adenosine stress perfusion CMR to assess pediatric coronary artery disease. Eur Heart J Cardiovasc Imaging. 2016:151. Lenz GW, Haacke EM, White RD. Retrospective cardiac gating: a review of technical aspects and future directions. Magn Reson Imaging. 1989;7:445-55. Carr JC, Simonetti O, Bundy J, et al. Cine MR angiography of the heart with segmented true fast imaging with steady-state free precession. Radiology. 2001;219:828-34. Atkinson DJ, Edelman RR. Cineangiography of the heart in a single breath hold with a segmented turboFLASH sequence. Radiology. 1991;178:357-60. Gibons RJ, Balady GJ, Briker JT, et al. ACC/AHA 2002 guideline update for exercise testing: summary article: a report of the American College of Cardiology/American Heart Association Task force on Practice Guidelines (Committee to Update the 1997 Exercise Testing Guidelines). J Am Coll Cardiol. 2002;40:1531-40. Sukpraphrute B, Drafts BC, Rerkpattanapipat P, et al. Prognostic utility of cardiovascular magnetic resonance upright maximal treadmill exercise testing. Journal of Cardiovascular Magnetic Resonance. 2015;17:103. Wei Z, Whitehead K, Khiabani R, et al. Respiratory effects on fontan circulation during rest and exercise using real-time cardiac magnetic resonance imaging. Ann Thorac Surg. 2016. Lurz P, Muthurangu V, Schievano S, et al. Feasibility and reproducibility of biventricular volumetric assessment of cardiac function during exercise using real-time radial k-t SENSE magnetic resonance imaging. J Magn Reson Imaging. 2009;29:1062-70. Kuhl HP, Spuentrup E, Wall A, et al. Assessment of myocardial function with interactive non-breath-hold real-time MR imaging: comparison with echocardiography and breath-hold Cine MR imaging. Radiology. 2004;231:198-207. Gerche A, Claessen G, Ban de Bruaene A, et al. Cardiac MRI a new gold standard for ventricular volume quantification during high-intensity exercise. Circ Cardiovasc Imaging. 2013;6:329-38. Kellman P, Chefd’hotel C, Lorenza CH, et al. Fully automatic, retrospective enhancement of real-time acquired cardiac cine MR images using image based navigators and respiratory motion corrected averaging. Magn Reson Med. 2008;59:771-78. Kellman P, Chefd’hotel C, Lorenz CH, et al. High spatial and temporal resolution cardiac cine MRI from retrospective reconstruction of data acquired in real-time using motion correction and re-sorting. Magn Reson Med. 2009;62:1557-64. Hansen MS, Sorensen TS, Arai AE, et al. Retrospective reconstruction of high temporal resolution cine images from real-time MRI using iterative motion correction. Magn Reson Med. 2012;68:741-50. Bland JM, Altman DG. Statistical methods for assessing agreement between measurement. Biochimica Clinica. 1987;11:399-404. Pitman, E. J. G. A note on normal correlation. Biometrika. 1939. 31:9-12.